Playing toddler games and engaging in toddler activities is not only fun, stimulating and a great way to spend time with your child, it also effectively fertilizes the ground for cultivating many important life skills (the benefits of which we will get to in a bit). The inspiring toddler activities you'll see on this page will be tailor-made your child's age - although older kids may have lots of fun with them too. One-year-old until the age of two. Two-year-old until the age of three. Three-year-old until the age of four. Being 100% present here and now with your toddler is one of the most important gifts you can give your child. Really, I'm not kidding! Nothing beats love and attention. When your child experiments, expresses himself / herself, tries new things and succeeds, this process of 'mastering' the world on your own terms will pave the way for the vital existential belief of 'I can'. This 'I can' may sound trivial but it is not, I can assure you. 'I can' is one of the most essential and basic building stones of self esteem and consequently self realization: living out your potentials! Many games have an inbuilt logic that automatically teaches your child many aspects about communication and time, for instance in terms of taking turns, doing things in a certain sequence etc. Recent research has made a strong link between great motor skills and strong learning abilities. In short the conclusion is, using the body, boosts the brain! By the way, did you know that from birth to the age of four, children pass more developmental milestones than at any other stage of their lives. So dig in, get inspired and prepare to have hours of fun with these fun toddler games (and yes, some of them your toddler can do alone) which at the same time function as inspiring learning activities for toddlers. This most basic of toddler game will help build your child's fine motor skills, improving their ability to pick items up using their forefinger and thumb. This is known as the "Pincer Grasp" and it will eventually lead to your child being able to do anything from manipulate the use of a pencil to buttoning up their own clothes. Sit your toddler in a highchair or safely at a table, and show him / her how to thread the cereal onto the string. It will take a few attempts for your toddler to grasp what they are meant to be doing, but once your toddler does, he / she will have no problems getting the "Os" onto the string. As your toddler's confidence builds, introduce basic numbers into the game. 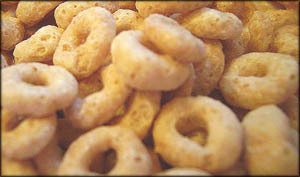 For example, thread five pieces of cereal onto the string, counting each piece as it goes on. According to the American Academy of Pediatrics, children develop basic number skills as young as 12-months-old, so this fun toddler activity is a great and fun way to introduce your toddler to numbers through play. The words paint and toddler in the same sentence are enough to strike fear in the hearts of even the most devoted of parents. 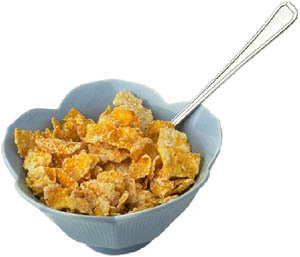 Simply place a piece of A4 paper in to an empty cereal box, no need to fold the paper. 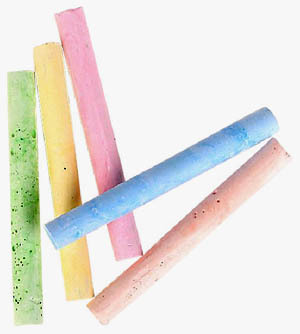 Using crayons, dip the ends into a variety of colored kid's paint - you won't need a lot. Throw the crayons into the box and tape the opening closed securely. 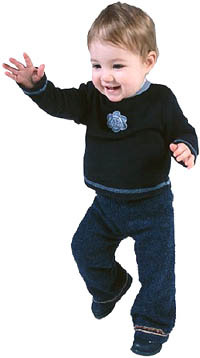 Give the box to your toddler and tell him to shake it, encourage him to be enthusiastic. Once the box has been shaken for as long as your toddler has the patience for it, open it up carefully and remove the paper. The result should be a truly creative masterpiece your toddler will be proud of. Proof itself that not all toddler games mean mess and chaos! Here is a great game that will fuel your toddler's sense of curiosity and exploration as well as fine-tuning her finger dexterity. Also this is a game that your toddler can play independently next to you while you're cooking or doing other household chores that you need to get done. All you need to do is to devote 5 minutes of preparation. Consider donating a kitchen drawer to your toddler or find a good sized cardboard box. What you need an empty, confined space. Find as many empty small boxes, jars, containers, canisters etc. as you can. Fill each one of them with small interesting objects from around the house or go into your toddler's room and find whatever small toys that that fit in the containers. Put the lids back on them and put them all in the drawer or box or cupboard and close it. 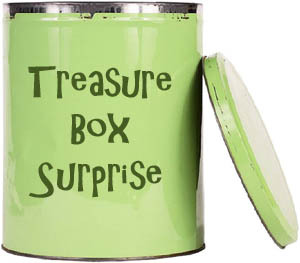 Invite your toddler to open the 'big treasure box' to find many 'small treasure boxes inside'. Show your toddler how to open one container at a time to take out what's inside. Once your toddler gets the drift of the game, containers will probably be opened faster and faster - so the more surprises you have prepared, the longer the game will last. This one of learning activities for toddlers will stimulate your toddler's senses as well as teach him some of the most basic principles of physics. And who can teach us better than Mother Nature. Go out into your garden or the nearby park. 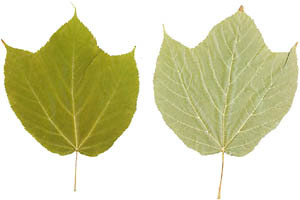 Find, pick up and gather leaves in many different forms, colors and conditions (green and withered). You can also gather funny stones or nuts if you feel like it. Decorate the paper together gluing on the leaves, nuts and stones. The result can be really spectacular if you choose a colored piece of paper in e.g. yellow, orange or red. If the weather is nice and warm, this toddler game will provide lots of great fun for your little one. As it involves water, you need to be nearby and never leave your toddler unsupervised. Take your hose or a big bowl with water and splash water all over it. This will create small, shallow pools here and there. 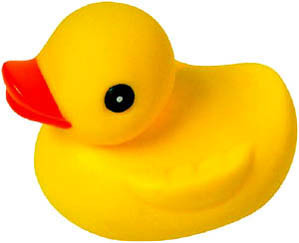 Pick out some of your toddler's toys that are water resistant and place them on the plastic and in the small pools. Fill up a few plastic cups and bowls with water too and place them onto the sheet as well. Show your toddler this amazing flat lake of adventures and watch the joy it will make. The one game is great for stimulating cognitive thinking in terms of gently introducing the abstract skill of categorization along with fun memory training. Tell your toddler to go and find a toy. Tell your toddler whether the toy is big or small and thus which bag to put it in. After having put in 4-5 toys (not too many), ask your toddler where each of the toy is, one toy at a time. And your toddler will have to go to the right bag and rummage through it to find the right toy. Create a wonderful and exciting physics lab for your toddler. These types of toddler games will have the potential for hours of fun for your toddler. 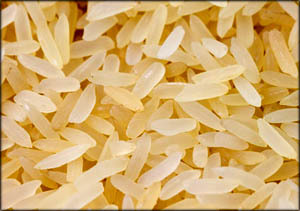 Find a box of oats or bag of rice that are overdue and that you are going to throw out anyway. Add some cups, spoons and toys (cars, dolls, toy animals etc.) and let your toddler have fun with feeding the dolls, digging, ploughing, piling etc. By the time your child reaches two-years-of age, you will notice their enthusiasm for learning has increased yet again. Not only will toddlers have mastered walking by this age, their speech will be rapidly improving. Games for this age group are slightly more advanced to account for your child's growing knowledge, comprehension and abilities. 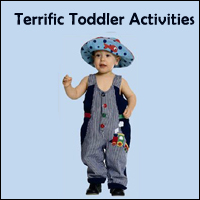 Acitivities for toddlers at this age need to be interesting, as their concentration span is still fairly short. Using A4 paper, draw or print five large squares, circles, rectangles and triangles. Mix them all up and then tape them to the floor in a square. Ask your toddler to start the game by touching a body part on a shape of their choice. The idea is you shout out a body part, such as the arm, foot or nose, and then shout out a shape. Your toddler then has to put the correct body part on the right shape. Your toddler will find this game highly amusing, as they tie themselves in knots trying to get to the right shapes. However, as well as fun, your toddler is becoming more familiar with different shapes and parts of the body. 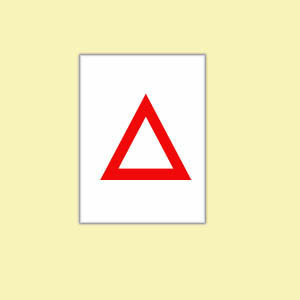 You can turn this activity into a game for the whole family by simply drawing or printing off more shapes. Many parents feel guilty about the lack of time they have available to spend one-on-one with their toddler. With busy work and home lives, it is often difficult to set aside time to play exciting games. However, you can turn many of the boring chores you have to do around the home, into exciting games for toddlers. For instance, learning to throw and catch is harder than it looks, so when teaching your child to do these tasks, it is always a good idea to start with something soft - such as socks. When you are doing the laundry, have your toddler sort the socks into piles according to color. Once this is done, help your toddler ball them into pairs and ask your youngster to throw each pair into a laundry basket or box. Getting the socks into the basket will help improve their hand-eye coordination, as well as help them learn to judge distance. 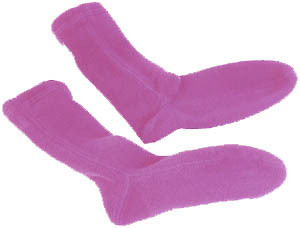 You can then begin to pass the socks back to your child by throwing them. Your toddler is likely to drop many more than he can catch at first, but if you play this toddler game on a regular basis, you will be surprised how fast your toddler will pick it up. Another bonus: You will also get to enjoy time playing with your toddler, while still completing a chore. 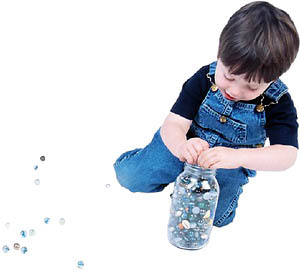 This one of the fun activities for toddlers is like a simple variety of a treasure hunt. In this way older children are bound find this toddler game fun, too. 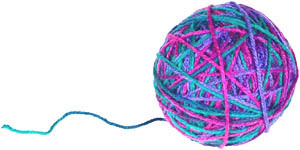 Find some long string or thread - the longer the better. The more colorful, the more exciting! Tie the thread in a loose knot to something in your toddler's room and go for a walk around your home with the thread thus leaving a long thread trail: go around corners, under tables, below duvets, around the chairs, open the fridge and close it so the string is held firmly by the closed fridge door etc. Just use your imagination as you walk! End the trail somewhere with a hidden treasure e.g. in the tub, in a cupboard or a big box where your toddler will find a bowl of delightful fruit snacks. Done? Good, let the game begin! Follow your child's route through the house picking up the thread as you go. Tell your toddler that he needs to hold on to the thread as he goes (this will make it easier for him to stay on the right path). This outdoor game is ideal for a hot day. I actually remember having lots of fun doing this myself when I was a child. As this is a game that involves water, make sure to supervise closely. 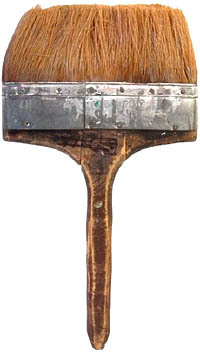 Fill up a bucket of water and find a nice big paint brush. Take a walk around the house and find elements that could be fun to paint. I remember that the things that were most fun to water paint were things that changed color and went significantly darker when wet - like dry woodwork. If your toddler has a wooden play house that would be ideal. This game can go in many directions all depending on your toddler's personality. Some toddlers might be very systematic and take a long time painting the whole thing until the project is done. Other toddlers might paint a little bit and then start 'painting' themselves and start splashing games with the water. Whatever the case - your toddler will do what is most fun for him or her and that's the whole purpose of it, right! This is another playful activity for the outdoors. This one is great for improving bodily coordination and strengthening flexibility. The only thing you need is some pavement chalk. Although some white chalky stones can also be used. Draw a few simple images on the pavement e.g. a sun, a face, a star, a car, a flower, a tree etc. Then ask your toddler what else you should draw. You're toddler will surely have some favorite toys that she would like to see drawn on the pavement. Once you have drawn 10 or so images, make up bodily activities that involve the drawings. E.g. jump from one drawing to another, throw a ball and see if you can hit a specific drawing, see if you can touch two drawing at the same time etc. Even though the actions in this toddler game are physical, the game itself is rooted in a form of cognitive play. Through this extended game (yes, it will last a whole day), you will introduce systematic thinking to your child in terms of applying simple thought principles to actions. Introduce the concept of color days, which are days when everything (or as most as possible) circles around a specific color. If the color is green, let your toddler start his morning by picking out his green clothes. Inspire your toddler to gather together all his green(ish) toys. Doing so will probably make some new interesting play combinations that your toddler has not yet tried. Serve lots of green foods. Go outside and talk about all the green things you see. There are no limits to the 'green' possibilities in this game. So put on your green glasses to see the world in a new, green light! Most kids love playing with a flashlight in darkness where they get to see and experience the world in an entire new, fascinating way. Build a 'cave' with your toddler by covering a small table with one or two big blankets. Make it nice and comfy inside with pillows, favorite toys and the most important thing of all, a flashlight. When you're done playing, end the toddler games session with a good story read out loud in the light of the flashligt. Three-years-old marks the transition from toddler to preschooler and the fact your baby is becoming more of an independent child. As you have probably noticed, children of three are able to engage in more complicated play. For instance, you may also notice your toddler is developing a much more vivid imagination which can also be used in your toddler games. The saying "the old ones are the best" is most definitely true when it comes to this exciting toddler game. Not only does this game promise lots of fun, it also helps your toddler learn to follow directions. Hide and Seek is a game that obviously requires a least two people and you should encourage your toddler to count as far as they can, introducing higher numbers each time you play. A twist on the game is blindfolding your toddler, obviously ensuring they are in a contained and safe environment. Covering the eyes will help your child learn to rely on their other senses, something other toddler games do not always do. Once they are blindfolded, offer them directions to find the missing person (who could be you), such as turn right or left. Give them a hint, like you're very hot or cold, when they may be near the area the person is hiding. This game, one of the oldest activities for toddlers around, helps to develop hand-eye coordination and encourages enhanced cognitive development all round. 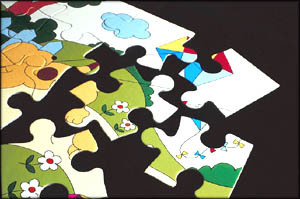 Doing the same jigsaw puzzle over and over again can be boring for a young child, so giving this old favorite a twist will make the fun last longer. Take the pieces of your toddler's favorite jigsaw and hide each individual piece in a different place all over the house. Each time your child finds a piece, tell him / her them to bring it back to the table and see how it fits the other found pieces. You could, if you wanted to, leave clues with the jigsaw pieces, by drawing pictures on a piece of a paper. For example, one clue may be a picture of the refrigerator, telling your toddler that the next missing piece is either in or around it. This is a musical game where your toddler gets to make her own instrument. 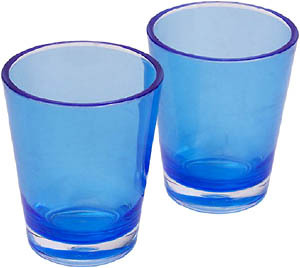 Find 5-10 glasses - it doesn't really matter if they are similar or not. Pour water into them - but let the amount of water vary. Thus some glasses will be almost filled to the top, some almost empty. Show your toddler how to gently hit the glasses with a spoon and listen to the different sounds they make. Show your toddler the 'magic' of adding more water or pouring out water to change the sounds. If you're really clever, adjust the amount of water so that you can play your toddler a real song while you both sing. Let you toddler have fun with the eating experience itself while at the same time helping him develop his fine motor skills. Go out and buy a few sets of Chinese chopsticks (they are very cheep). Prepare a Chinese meal with noodles, and stir fried chicken bits (no bones) and vegetables, e.g. mini corncobs and sugar peas (things that are relatively easy to pick up with the chopsticks) and fry it all in oyster sauce (most kids love noodles and oyster sauce has a rather sweet taste). If your child doesn't mind the taste of garlic and ginger put in a bit of that too for flavor. This one I have used quite often with my own son and he just loves eating with chopsticks. Mind you, he doesn't use the chopsticks 'correctly' - has one in each hand - but who cares, as long as he has fun eating. 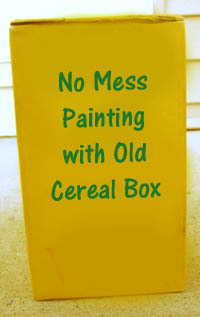 This is another one of the fun indoor activities for toddlers, I have used quite a bit with my son. 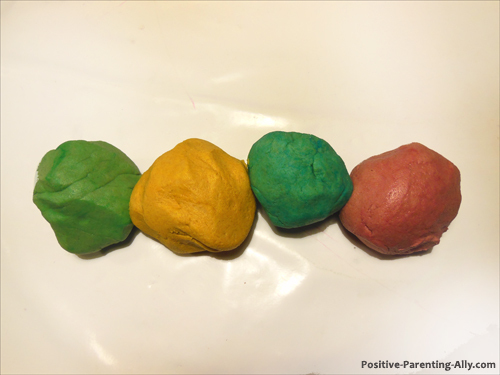 Make some dough out of flour, water, some cooking oil and some fruit coloring, if you have some. (You can also go to my page, play doh recipe, and just follow the simple guidelines there). Put the dough on a plate or a tray and introduce it to your toddler. The possibilities of use are endless. My son has a deep fascination with animals, so we created footprints by pressing his toy animals down into the dough leaving some beautiful, different prints in the dough. You can also make food for dolls (bread and buns) or make funny animals or figures out of the dough. And when you're done playing you can put the dough in an airtight plastic bag to use another day. This game for toddlers will be very exciting for your toddler as it has the potential of involving the forever fascinating sensory interplay of taste and touch. Put an oilcloth on your table and if you're indoor cover the floor around your toddler's seat with old newspapers as it can be quite messy once your toddler gets going. Put lots of different basic food ingredients in bowls on the table: e.g. flour, muesli, water, oats, lemon juice, yoghurt etc. Also put a few plastic cups and spoons and empty bowls on the table, too. Inspire your toddler to mix different items and try how they taste and notice their new consistency when liquid mixes with more solid matter. With this type of activities for toddlers you make cleaning up exciting with interesting riddle-like tasks your toddler has to perform for the pure fun of it. This game can be used in any room of the house. You mere need to just my example to fit your current circumstance. Here we take the example of cleaning up your toddler's room. Tell your toddler that you are going to play a fun game that is called the Cleaning up game. And go on in the same way with other toys e.g. telling your toddler to find things that have eyes, or that can drive, or that are pink, or that are fluffy etc. Don't expect to be able to play the game until everything is tidied up. Your toddler will probably be distracted along the way and perhaps also get enough after a while. But it may take you quite far ... all while having fun. Whatever toddler games you decide to play with your child, there is no doubt that each one will be a learning opportunity. Even the most basic of toddler activities, offer your child an educational experience - through the senses, the mind and feelings. And what better way to learn about the oneself, others and the world than through joyful play. 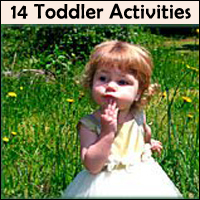 Both Outdoor and Indoor Toddler Activities.